The BC Startup in Residence – STIR – program brings the ideas and expertise of startup tech companies together with government business areas to co-develop technology solutions, improving services delivered to British Columbians. Modeled after San Francisco’s successful Startup in Residence program, the B.C. Startup in Residence (STIR) program connects B.C. tech startups with provincial government business areas to collaboratively and iteratively develop technology-based solutions for public-sector challenges within a 16-week timeframe. The selected startups participate in a paid development phase and product trial period, at which point each government business area has the option to enter into an ongoing contract for further development, access, or maintenance of the solution. Last year’s BC Startup in Residence (STIR) pilot program was a resounding success, as six BC tech startups worked with the province to develop solutions to a number of government-related challenges. With the posting of five projects to BC Bid, the Province has announced that they will be extending the program for another year. Once again, BC tech companies will have the opportunity to participate in a 16-week residency where they will gain insight into working with government and develop their own intellectual property, with the ability to sign multi-year contracts for further development, future license fees or maintenance work. See below for a summary of current opportunities. The call for proposals will close on July 25, 2018. The Ministry of Jobs, Trade and Technology is looking for a solution that can automatically index and tag content related to grants and funding so that users can find appropriate economic development funding options based on their needs. The Environmental Assessment Office is looking for a way to allow users to quickly and accurately identify topics mentioned in comments received by the public. The solution should allow users to visualize topics in a way that provides them with information they can use to support the environmental assessment process. The Ministry of Attorney General is looking to move its paper-based court interpreter scheduling and payment processes online. The solution will incorporate the existing directory of interpreters and enable clerks throughout the province to schedule and pay interpreters through an online system. 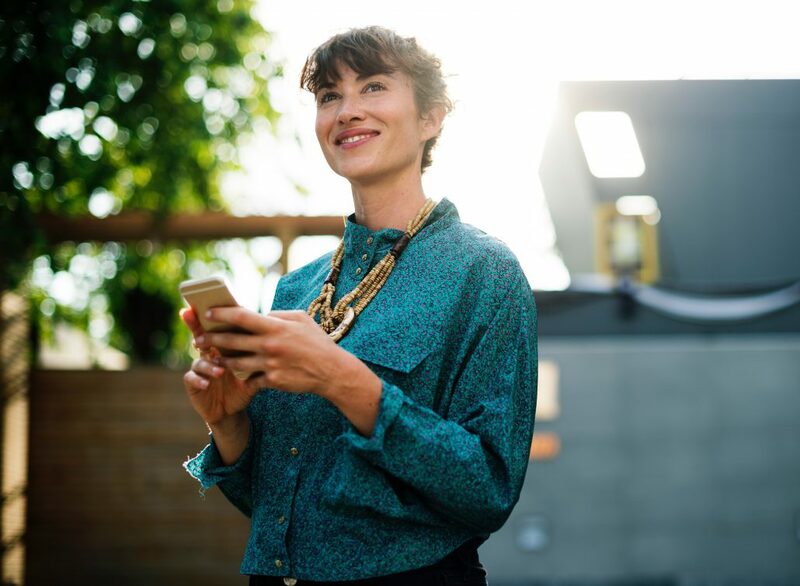 The BC Public Service Agency needs a modern, online tool that will allow public servants to donate to registered charities through payroll deductions and other methods. The Ministry of Indigenous Relations and Reconciliation is looking for ways to streamline its analysis of Crown land parcels under consideration for inclusion in negotiations throughout the province. The BC Tech Association (BC Tech) announced the winners for the 2018 Technology Impact Awards (TIAs) on the evening of Friday, June 1, 2018. The longest-running and largest technology awards program in the province, this year the TIAs marked the 25th anniversary of celebrating excellence and innovation in BC’s tech sector. Among the esteemed winners, Koots fixture and Canada’s largest diversified resource company, Teck, was awarded Excellence in Technology Adoption. Committed to responsible mining and mineral development with a focus on copper, steelmaking coal, zinc and energy, over the last 100+ years, Teck has helped to build communities, create jobs, and drive innovation, making the natural resource industry more sustainable. Other recipients include, ACL for Company of the Year, delivering enterprise governance SaaS solutions that help governments and the world’s largest companies quantify risk, stamp out fraud, and optimize performance. Person of the Year was awarded to CEO of Copperleaf, Judi Hess for her work and leadership helping grow the Vancouver-based software company providing decision analytics to companies managing critical infrastructure as one of the top 20 biggest software companies in BC, and one of the fastest-growing software companies in Canada. Startup of the Year was awarded to Klue, a market and competitive intelligence platform that helps sales teams to win business. Their platform combines information shared by team members with bot-collected and machine-curated intel from across the web, in order to provide to up-to-date intelligence on competitors. There were many more outstanding BC businesses honoured. If you’d like to read more about the event and the other recipients please click HERE. Making BC the best place to grow a tech company has been the mission of the BC Tech Association since 1993. While their members focus on growing their businesses, BC Tech has been providing opportunities for industry members to collaborate, learn, and grow together. The organization is dedicated to connecting companies, developing talent, and advocating so technology & innovation as well as the province thrives. To learn more visit www.wearebctech.com. 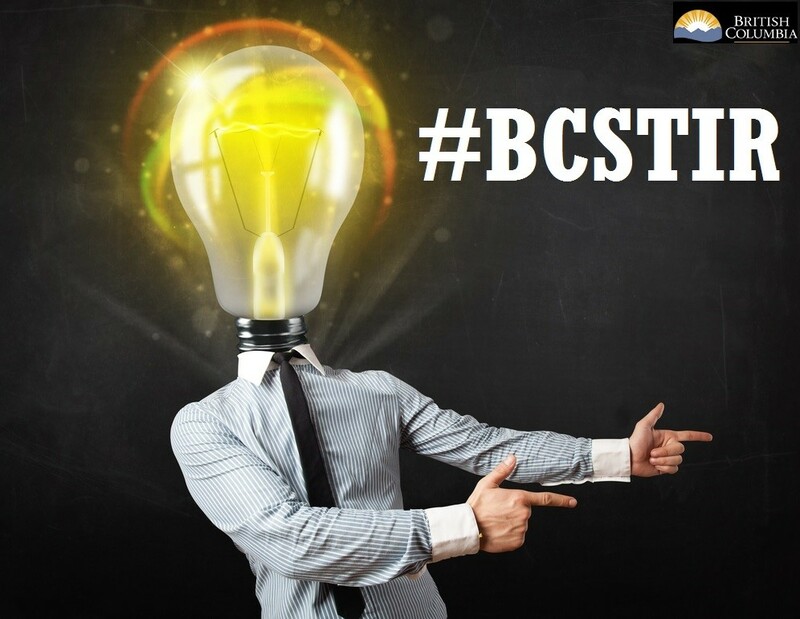 The BC Startup in Residence (STIR) pilot is an experiment to bring the ideas and expertise of startup tech companies together with government business areas to rapidly solve public sector BC STIR 2017 Challenge Statements. Proposals due no later than Wednesday April 12 at 2:00PM DETAILS HERE! June-October: 16 week pro-bono residency. Government and participating companies will learn from each other as they sprint through a 16 week summer residency, working side-by side to develop and launch their solution in the fall of 2017. During the Victoria-based pro-bono residency, government and tech company teams will collaborate in government team space, (the lab if there is a web presence) and online to iteratively make their vision a reality. Teams across the STIR pilot will also come together as a cohort for workshops, guest speakers and mentor sessions, and mixers to make the most of one another’s experiences. access to a network of alumni. Check out more information about the info session HERE. Some valuable Q & A HERE. Click the links in the BC STIR 2017 Challenge Statements for individual Calls for Proposals and see BC Bid to complete mandatory registration. To search for all STIR CFPs, Browse Opportunities by Organization and select “Ministry of Jobs, Tourism and Skills Training”. MIDAS (Metallurgical Industrial Development Acceleration & Studies) is an applied research, commercialization and digital fabrication training facility in Trail. KAST and Community Futures of Greater Trail have received funding to create a new fabrication lab at 2950 Highway Drive. Cover Architectural Collaborative Inc. has been working with KAST and MIDAS, as well as engineering sub-consultants, to establish a scope of work for a renovation of the building to meet the needs of the new facility. KAST invites firms to submit Construction Management proposals for the noted work. This proposal is not intended to be an onerous amount of work. A simple letter response with the requested information will suffice. The proposal call document and some small scale KAST_MIDAS Renovation Plans showing the general extent of work are attached: RFP for Construction Management Services- Jan 5 2016. Please submit proposals directly to Amber Hayes, MIDAS Project Director at midas@kast.com, no later than 2PM on January 5th, 2016. Email to midas@kast.com or hand delivered (to KAST at 108-2196 LeRoi Ave in Rossland) is acceptable. 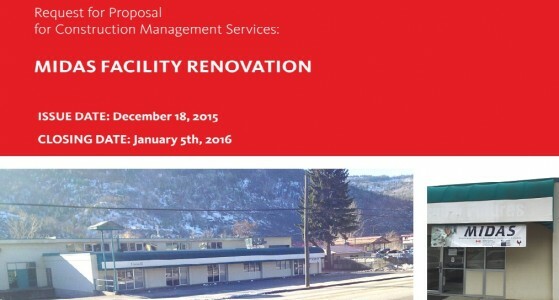 The intent of this proposal call is to select a CM/contractor to complete the work early in the new year, January to May 2016. The project budget is approximately $450,000. Providing cost control input to maintain this budget or less is essential. The owner’s intent is to complete as much of the renovation as possible. Work outside the project budget may be deferred. Building permits will be required for the renovation. 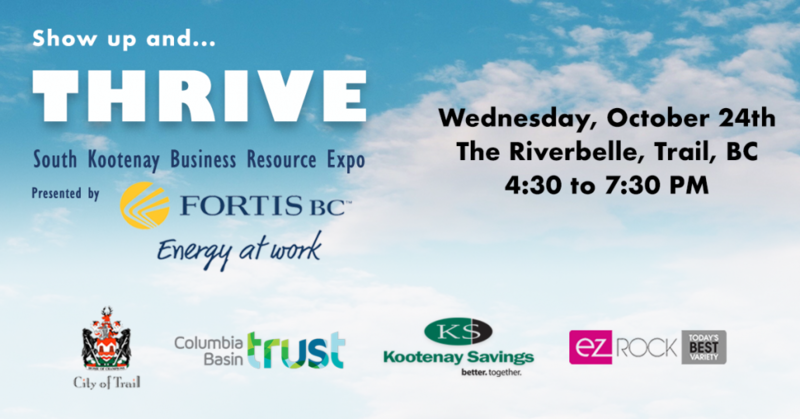 If you would like a tour of the building please contact Amber Hayes at 250 368 7618 to arrange a time.